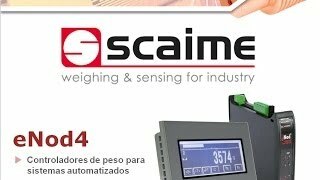 ENOD4-C-DIN Transmisor De Peso + Checkweigher Scaime A&D Tecnologías S.A. de C.V.
Presentación sobre riel DIN de vivienda. Dispositivo de detección de fallo de células de carga. 2 entradas digitales (4 con opción IO ) y 4 salidas. Servidor web integrado para monitoreo y configuración remota. eNod4 is a high performance weighing controller for automated systems. It offers fieldbus and Ethernet connectivity with PLC: CANopen, Modbus-RTU, Modbus-TCP, Ethernet/IP, Profibus-DP and Profinet. eNod4 is available in 3 versions offering advanced functionalities : weighing transmitter, dosing and filling controller, checkweigher. eNod4 provide a process weighing solution for bagging , dosing or filling, grading or sorting machines and checkweighers.